Ben Leech's postcards depict uncommon perspectives of Philadelphia. A Pennsylvania artist’s Kickstarter page has gained traction for its “36 Views of Philadelphia: An Archivolt Press Postcard Book” project. Ben Leech launched the page to make his collection of unique postcards depicting lesser-known areas of Philadelphia, totaling 36 4x6 cards bound in a hand-printed letterpress. Leech insists these are not your typical touristy postcards, though. “This isn’t your standard Liberty-Bell-and-Rocky-Steps tourist fare; the collection includes buildings from every corner of the city, from the Center City skyline to abandoned North Philadelphia factories, from Art Deco jewel boxes to Mid-Century Modern behemoths, West Philly storefronts to South Philly churches,” he writes on the Kickstarter page. With still more than a week to go until the campaign closes, Leech has already met his fundraising goal of $2,500, now nearly doubling that goal in donations. Leech works as an architectural historian and historic preservationist, as well as an artist, and often his artwork leads to more extensive research or preservation projects. 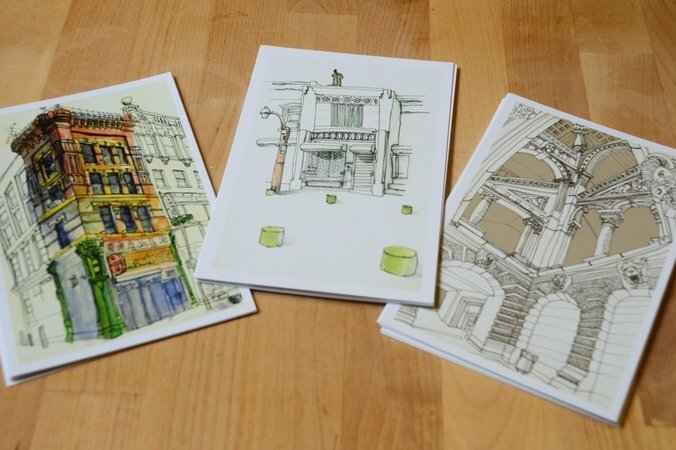 Scenes depicted in the cards will no doubt cater to like-minded architecture, preservation, and urbanist city buffs, but all Philadelphians can also take pride in seeing the city through fresh eyes. Leeche’s work is evocative of other self-made local artists have depicted the city in similarly unique ways. Philly Love Notes founder Emma Fried-Cassorla, for example, creates custom woodcut maps of the city, and the photographer known as AustinXC04 has an ever-growing collection in his Philly Home Portrait series. “If this campaign is successful, I have plans for additional Archivolt Press postcard collections, poster and pamphlet projects, architectural guidebooks, and collaborations with other artists, photographers, and historians,” the Kickstarter page reads. Check out the full page, and more postcards, here.